WORKERS UNITE FILM FESTIVAL SALUTES 1199/SEIU - A SPECIAL EVENING OF FILMS AND DISCUSSIONS ON WORKER/LABOR ISSUES FOR 1199/SEIU MEMBERS & FRIENDS. Left and Right Unite to Fight Vidant Hospital Corporation's Closure of Belhaven Hospital. The Story of America is a unique project to both document the story of our divided nation in 2013, and engage those with the power to heal these divisions - the people - in the transforming power of storytelling and dialogue. fight to stop the spread of racist anti-voter laws by the GOP in North Carolina and throughout the South. A passionate argument on behalf of the middle class & workers, this film features Robert Reich-professor, best-selling author, and Clinton cabinet member-as he demonstrates how the widening income gap has a devastating impact on the American economy. Ray Rogers - Opening and short A Movement Erupts (Stop Killer Coke Campaign) Coke’s Union Strategy (animation) followed by a series of films highlighting the damaging impact of Coke. SPECIAL EVENING EVENT Sponsored by the NY Taxi Workers Alliance: RAISING FOR RANA 2. And evening of films and discussion about Bangladeshi Garment Union workers and their struggle to organize and survive after the horrific Rana Plaza collapse one year ago. It's the General Strike of 1926 - only seven years after the slaughter of the trenches. Miners’ unions lead the country against savage austerity cuts handed to the nation by a Liberal-Conservative government. Inspired by true stories from local families in Fife, The Happy Lands follows the journey of law-abiding citizens who become law-breakers in a heroic battle against the state. It's never a good time to stand up for your rights - but it's always the right time. In the summer of 1988 Cesar Chavez, then 61 years old, embarked on a water­ only fast – a personal act of penance for not having done enough to stop growers from spraying toxic pesticides on farm workers. For more than a month no one, including Cesar, knew when he would eat again. Chavez risked his life in pursuit economic justice for America’s most vulnerable workforce. As Augusto Pinochet, backed by the US governemt, murdered a democractically elected leader, Salvadore Allende. Thousands of union members, students, leftists and all manner of Allende supporters were rounded up into killing centers. Scottish union ariplane engine mechanics saw news footage of this brutality and decided to take action. A NYC premier of this sharply aimed film about Wisconsin and Chicago teachers fighting back against the onslaught of anti-union governors and big city mayors willing to sell out public education to the burgeoning power of the for profit charter school movement – which just happens to be mostly union-free. "Tangled Thread" chronicles labor rights activist Kalpona Akter's organizing efforts in Bangladesh’s garment industry before and after the Rana Plaza building collapse, which claimed the lives of at least 1,138 garment workers. Tears in the Fabric follows Razia as, amidst the struggle of raising and educating her grandsons, she searches for resolution and answers through protest on the streets of Dhaka and amongst the rubble and torn fabrics of Rana Plaza. Q & A w/ speakers. Overpass Light Brigade' is a short film that tells the story behind Wisconsin's Holders of the Lights using innovative time-lapse photography and interviews with founding members and other activists. Produced by the festival to illuminate other major arts groups working everyday to create and present live theater in NYC on the lives and issues of working people. We focus on The Working Theater, NYC’s pre-eminent producer of original plays that deal with working people’s lives. Ambitious executive, Julien is about to start a new job at a new company. He finishes dressing, when suddenly the most amazing things begin to happen. A smart, pointed, yet self-censored film criticizing press censorship of the Gezi Park protests which occurred between May-July 2013 in Turkey. Your boss gives you three days' notice that your workplace is closing. You will be unemployed in a recession, without the severance the law says you deserve. If you are the employees of Republic Windows and Doors... you fight back! For six days in December of 2008, laid-off Chicago factory workers took over their closing workplace, declaring they would not leave until the owners and creditors agreed to pay them the severance they were owed. The stereotype of Jews as non-athletic, as well as anti-semitism, are two issues that many Jewish baseball players faced and had to overcome. All ballplayers were exploited until the formation of the Major League Baseball Players Association.The film is in part about Jewish immigration, assimilation into American society, bigotry against Jews, the passing on of Jewish traditions even during assimilation, heroism, and the breaking of Jewish stereotypes. This awarding winning documentary documents firsthand the turmoil in the aftermath of the British Miners Strike of 1984 85 and the parallel struggle of the UMWA in its long running battle with Pittston Coal. This film brings to life the real struggles of working people at the pivotal moment when state power was used to open the floodgates to global capital, aid the destruction of coalfield communities and its labor institutions. A charming and eye-opening live action short documentary, that reminds us of the tens of thousands of underpaid and unprotected workers who help get our daily meals into our fridges and on the table. One Penny More: By leveraging its high-volume purchasing power, the U.S. supermarket industry plays an active role in farmworker exploitation. Both by forcing low wages and brutal working conditions on farmworkers, these chains contribute to unfair labor conditions. They have the power to help solve them to. Dia Internacional De La Mujer: In March of 2013, the Coalition of Immokalee Workers and their allies embarked on a 200-mile march from Ft. Myers, FL to Lakeland, FL, home to supermarket Giant, calling on the grocery chain to enter into the CIW’s Fair Food Program, a unique partnership among farmworkers, Florida tomato growers, and participating buyers that guarantees farmworkers’ human rights and increased pay. Working conditions on the banana and pineapple plantations of Latin America are tough... here workers tell of trade union persecution, low wages and exposure to pesticides. THE HARVEST/LA COSECHA profiles three children who are pulled away from childhood to work on a farm as they journey from the scorching heat of Texas’ onion fields to the winter snows of the Michigan apple orchards and back south to the humidity of Florida’s tomato fields to follow the harvest. A short film and presentation from this foundation, that reaches out to marginalized working people on both sides of the Israeli/Palestinian conflict to help increase the delivery of health and wellness services to these underserved populations. A Holocaust survivor's remembrances in uniquely beautiful stitched images and vivid accounts bring an uplifting story to the screen. Esther Nisenthal was 15 in October of 1942 when the Jews of her village in Poland were ordered by Nazis to report to a nearby train station. Esther’s story, and those like hers, compel us to build a just and peaceful world for all. 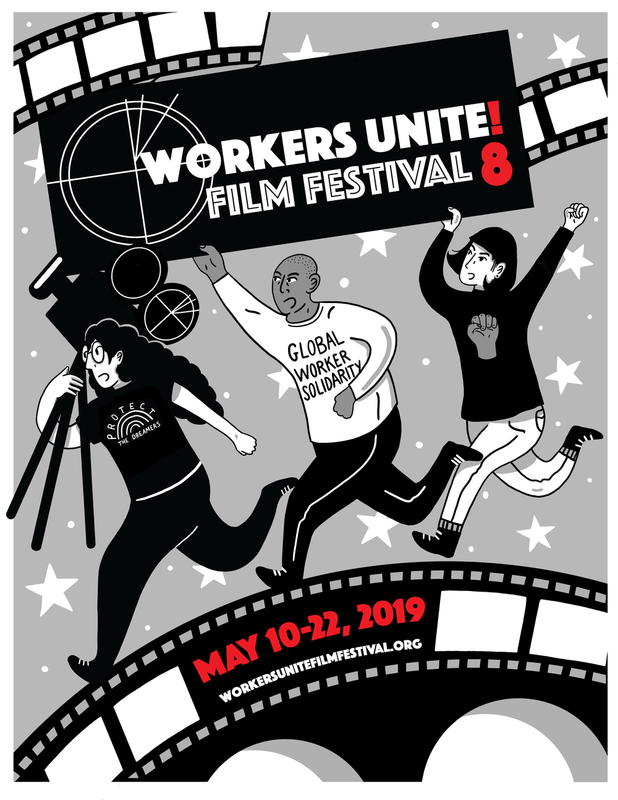 This film focuses in on the tragedy at the Triangle Shirtwaist Factory over 104 years ago and how the tragedy sparked massive labor unrest, organizing, demonstrations and ultimately brought the foundation of today’s occupational health and safety laws. ‘El Camino' follows the path of the anonymous migrant in search of the New World. This parable is a metaphor for the reality faced by migrants arriving in strange, new lands every day. Grace is about the daily obstacles and dangers of living in America as an undocumented worker. Based on a true story, this touching film drives home the capriciousness of our current immigration system. The hard and exploited work of waiting tables, where living off tips is the norm. Service employees deserve a living wage and the dignity of not having to perform every night in order to survive. When Scottish artist, Jan Nimmo, travels to Ecuador, the world's largest exporter of bananas, to gather workers' testimonies, she observes the formation of the first trade unions in the banana sector for 30 years. On June 1,1981,Silme Domingo and Gene Viernes, two reform officers in Seattle’s Alaska Cannery Workers’ Union, Local 37 of the (ILWU), were gunned down as they worked in the union offices. This touching and powerful film details the murders, the fight for fair labor conditions, the civil rights movement the murdered men helped foster, and the ensuing efforts to seek justice for their killings. Never Got a Dime is the story of Lilly Ledbetter, a former manager at Goodyear Tire and Rubber Company in Gadsden, Alabama. The Workforce Development Institute/ NY created "Women’s Initiative" to focuse on programs that help women become self-sufficient and reach their potential. The Women’s initiative provides opportunities for women from diverse backgrounds to come together and exchange ideas about issues faced by working women. 8 minutes. Captain Brenda Berkman of the FDNY broke every barrier in her rise to be one of the few women to lead an FDNY station, and she paid the price. She is a true hero of NYC and a hero to workingwomen everywhere. 'Overpass Light Brigade' is a short film that tells the story behind Wisconsin's Holders of the Lights using innovative time-lapse photography and interviews with founding members and other activists. This multi-media performance took its viewers on a journey weaving through the lives and experiences of the nine women veterans. High school students trained with women veterans at the Albany, VA, then acted out their stories during the live performances.The project offered female veterans an opportunity to talk about themselves in a unique way, and for the audience to gain a new understanding of their experiences. The story is told by the women themselves, five former "Rosies," who movingly recall their histories working in Detroit, Los Angeles, New York and San Francisco during the war. Highlight reel from the 2010 update of the Rosie The Riveter film. These clips are part of the Rosie The Riveter Project, now based out of the NYU Tamiment Labor Archives. This fim takes the audience on an intimate journey into the daily life of Judith, a street vendor from Guatemala who lives and works in New York City. A stirring portrait of the lives and legacy of the Reuther Brothers -Walter, Roy and Victor, pioneering labor leaders under the banner of the United Auto Workers Union. Mary Matthews is the national digital media producer/director for the Transport Workers Union. She films workers’ struggles, setbacks and victories nationwide so that all workers everywhere can know that they are not fighting for their rights on their own. Retail Reality: Shifty Business shows the struggles that retail workers face on a daily basis. Car Wash Workers in NYC Fight to Clean up Dirty Business. The story of the recently successful campaign by RWDSU to bring dignity and fairness to exploited "Carwasheros" around NYC. Looks at the Take Back the Land and Occupy Wall Street movements as they began to respond to the foreclosure crisis. The United States isn’t broke; we’re the richest country on the planet, and a country where the richest among us are doing exceptionally well. But the truth is, our economy is broken. The Story of Broke calls for a shift in government spending toward investments in clean, green solutions—renewable energy, safer chemicals and materials, zero waste, education. Based on an actual strike against the Empire Zinc Mine in New Mexico, the film deals with the prejudice against the Mexican-American workers, who struck to attain wage parity with Anglo workers in other mines and to be treated with dignity by the bosses. A cartoon about how we arrived at this historical moment of poorly funded public services and widening economic inequality. Explores the experience of eight women who, as young girls, taught on the Cuban Literacy Campaign of 1961.The film begins in 1961, when Cuba announced that they would eradicate illiteracy in one year. 'Parents of the Revolution' follows a group of activist parents in the Occupy Wall Street movement who believe that it's their democratic duty to teach their kids to speak out against injustice. This documentary gives an in-depth insight into the profound crisis that Greece is facing today. The country, which is facing the seventh year of a deep recession, is in a state of absolute collapse at all levels: financially, socially and politically. These documentaries highlight the struggles of workers from China, Turkey, South Africa and Haiti. Countries. Showing just a few of the similarities and differences between labor movements. Meeting Face to Face follows six senior Iraqi labor leaders as they tour 25 U.S. cities speaking to union audiences, university forums, and community gatherings. This short video gives voice to Iraqi workers and union leaders – men and women - as they explain the repression they face, the efforts they are making to secure a new labor law that allows Iraqi workers to form unions, and their call for international labor solidarity. This tightly focused documentary shows how after a decade of war, US attacks have spread the conflict across the border into Pakistan. Program 3: Tatanka: A "60s" Radical faces his sixties. Behind every activist that fought for civil rights or occupied Wall Street, there was a loved one who also sacrificed. Tatanka follows the bizarre and heartrending journey of one man whose unchecked idealism helped change the world but nearly tore his family apart. A celebration of SVA’s Social Documentary MFA program, with shorts and features from students highlighting the next generation of socially conscious filmmakers. Dana Kalmey's experimental video using auto shop sounds for soundtrack. A short ride on the 7 into Queens brings you into a complex, ethnically-diverse world, vastly different from the city that envelopes it - this is Willets Point. John Redmond's no holds barred portrait of the homeless population of downtown Manhattan, as they come to get the good food provided for the community by the Chelsea Church of the Holy Apostles. In NYC the poor, unknown and premature infants were buried quickly and anonymously by NYC’s prisoners in a desolate potters field off the Coast of City Island. Erik Spink & Amitabh Joshi's Hart Island goes to the root of the indignity, for these already marginalized people, when even in death, or thru death of a premature child, the unequal civic system takes one more shot at pushing them to the bottom of the ladder. This film follows a 5 foot tall dynamo of a working people’s dentist, as she tries to make her way as a professional, both serving the working class neighborhood of Washington Hgts. This film follows the evolution of Brooklyn street kid, subway train tagger and local community organizing legend, Dennis Flores. A businessman and a carpet installer enjoy a wild and playful friendship, but when their class-conscious bosses pressure them to steer clear of each other, the Romeo and Juliet of the workaday world must decide what's more important: how we make a living, or who we're living for. Class Dismissed brilliantly navigates the steady stream of misleading representations of America’s working class, from the dawn of TV’s Golden Age, to our current crop of reality shows, sitcoms, police dramas, fake courtroom shows and daytime talk shows.